DISTRICT OF COLUMBIA (AP) — U.S. Environmental Protection Agency managers were aware of the potential for a catastrophic “blowout” at an inactive Colorado mine that could release large volumes of wastewater laced with toxic heavy metals, according to documents released by the agency. EPA released the documents following prodding from The Associated Press and other media organizations. 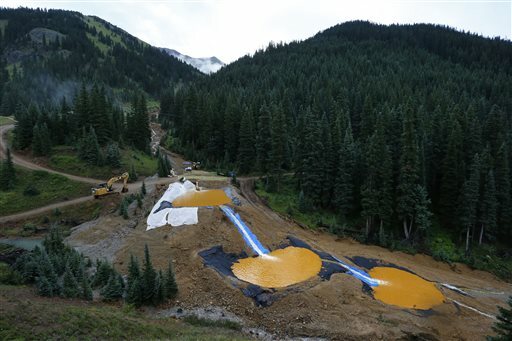 EPA and contract workers accidentally unleashed 3 million gallons of contaminated wastewater on Aug. 5 as they inspected the idled Gold King Mine near Silverton, Colorado. It was not clear what additional precautions were taken to prepare for such a release, and the EPA did not immediately respond to questions about the matter. A 71-page safety plan for the site produced by Environmental Restoration included only a few lines describing steps to be taken in the event of a spill: Locate the source and stop the flow if it could be done safely, begin containment and recovery of the spilled materials, and alert downstream sanitary districts and drinking water systems as needed. There are at least three ongoing investigations into exactly how EPA triggered the disaster, which tainted rivers in Colorado, New Mexico and Utah with lead, arsenic and other contaminants. The toxic plume travelled roughly 300 miles to Lake Powell on the Arizona-Utah border. EPA says its water testing has shown contamination levels have since been returning to pre-spill levels, though experts warn the heavy metals have likely sunk and mixed with bottom sediments that could someday be stirred back up. The documents, which the agency released about 10:30 p.m. eastern time Friday, do not include any account of what happened immediately before or after the spill. The wastewater flowed into a tributary of the Animas and San Juan rivers, turning them a sickly yellow-orange color. Elected officials in affected states and elsewhere have been highly critical of the EPA’s initial response. Among the unanswered questions is why it took the agency nearly a day to inform local officials in downstream communities that rely on the rivers for drinking water. Communication problems have persisted in the spill’s aftermath, according to U.S. Rep. Lamar Smith, a Texas Republican who chairs the House Science, Space and Technology Committee. In the wake of the spill, it has typically taken days to get any detailed response from the agency, if at all. The St. Louis, Missouri-based company bills itself as the largest provider of emergency services for the EPA and is the agency’s prime contractor across most of the U.S. The spill’s aftermath has cost the EPA $3.7 million through Thursday, according to information provided by the agency. To deal with the toxic water from the mine, which continues to flow out of the site, the EPA built a series of containment ponds so that contaminated sediments can settle out before the water enters a nearby creek that feeds into the Animas River. The agency said more work was needed to make sure there are no additional reserves of tainted water inside Gold King that could lead to another surge of contamination. Those efforts will include the removal of any blockages inside the mine that are holding back water, according to the EPA. That work is ongoing and no timeline has been provided for its completion. Written by MICHAEL BIESECKER, Associated Press, and MATTHEW BROWN, Associated Press; Brown reported from Billings, Montana. I told you so fun bag! Told you so! Told you so! These are VERY bad people. They were working diligently to get information out to the press said the secretary. I can just hear it- ” get those papers in the shredder now! Check everyone’s stories. Be sure they all tell the same lie! On and and on. Is it any wonder people have absolutely no trust in government? The qualification to work for government is to be a real scum bag. I have nothing but disgust for anyone who tries to say government is working in the best interest of the people. Never and not ever! obviously the state of UT would be inept at it because of mormon republican ideology of “use it all up while the gettins good”. They proved this time and time again… a few article back they let them open a big open pit tar-sands mine? the absolute dirtiest for of petroleum extraction…sounds great right? What is that smell? Oh, scummie. Didn’t realize you were here. Want to use my frequent flyer miles to get out of the area? Glad to help. Just the opposite FunBagist…..I’m not Mormom but it’s been on Fox news probably more because of the EPA loving liberal stations. You always have some crap to add and you think you are something else. Pathetic.